Mainers may get the chance to follow the lead of 10 other states that mandate employers offer paid sick days to their employees. “I’m proud to be part of a group of worker, family and health care advocates who have taken the first step in submitting language for a referendum to guarantee access to earned paid sick days for all Maine workers,” Jennie Pirkl, lead signer for the earned paid sick days coalition and organizing director at the Maine People’s Alliance, said Friday. By submitting language to the secretary of state, the coalition has taken the first step toward a possible citizen initiative that might go on the ballot as soon as next year. Pirkl said, though, that the group is still evaluating the best approach and may opt for a legislative push instead. “We all feel deeply the urgency of addressing the moral tragedy of workers forced to choose between caring for a sick loved one and keeping their job,” she said. Since Connecticut adopted paid sick leave in 2011, nine other states and the District of Columbia have added requirements to their statutes for companies to provide paid sick days. The rules vary among jurisdictions. 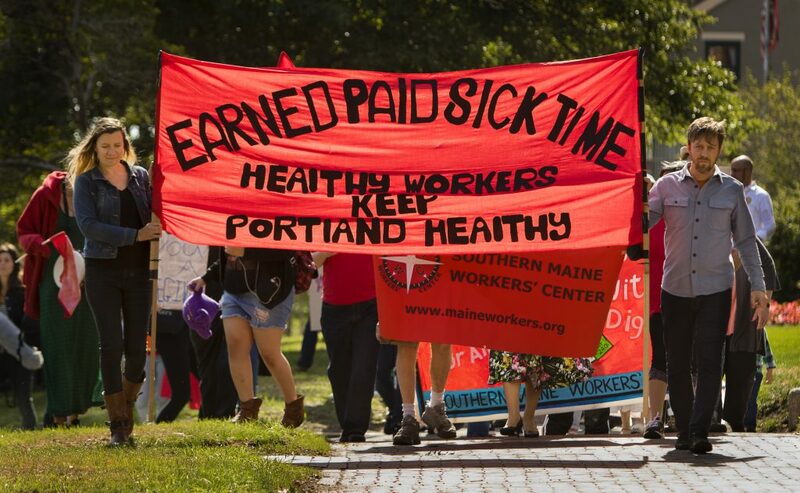 Pirkl said there is already an effort underway in Portland “by worker and small-business advocates to pass paid sick days” within the municipality. The proposal eyed by advocates would require employers to give one hour of paid sick time for every 30 hours worked — basically about half a day for every month worked — and to allow employees to roll over 40 unused hours of sick time annually. Business groups have fought against the idea in other states, asserting that it may put them at a competitive disadvantage and complicate scheduling for smaller companies. Most companies, though, already offer some form of paid sick time. Organizers said they anticipate the state would have to hire a part-time investigator to look into complaints if the proposal becomes law, adding about $53,000 in costs. It may also push up costs for contractors and localities, they said. Massachusetts, Rhode Island and Vermont each require paid sick time. In New England, only Maine and New Hampshire do not. The rules vary among them, however. Connecticut requires one hour of sick time for every 40 hours worked. Massachusetts opted for the same standard that organizers in Maine are eyeing. The federal Bureau of Labor Statistics found in 2016 that 64 percent of private-sector workers in the country have paid sick leave. Ninety percent of government workers do, it said. It also found that the lowest-paid workers were the least likely to have access to paid sick leave. Only 27 percent of workers with the lowest wages get paid sick days, the bureau found, while 87 percent of the highest-paid employees had paid sick time. Maine law does not require employers to provide paid vacations, holidays or paid sick leave. To put an initiative on the ballot, organizers need to collect 60,000 or more signatures. The exact number is based on the gubernatorial vote totals, which won’t be known until after the Nov. 6 election.